Tailwind is the name of the Flyball team that calls the Superdog Spectrum home. Flyball season came to an end on September 30th after a very successful and fun-filled season. They all had a good year, with many mile stones achieved, and they're happy with how the teams finished overall. Early in the season, Tailwind welcomed some new team members from the Flyball class at the Spectrum...people & their canine partners who decided to make the leap and join the club. Shadow (Remo) made his debut in Springbank and raced as if he'd done it all his life. Cooper (Brenda) made his start the following week in Edmonton and did just as great. Spectators at the races in Edmonton stopped to watch as Joey (Kari) blew everyone away by running in the low 4's! He filled in for Daniele's JRT (Buddy) at the last minute when Buddy was unable to compete. Bee-Jay (Terri) is still practicing and should be ready in the new year. 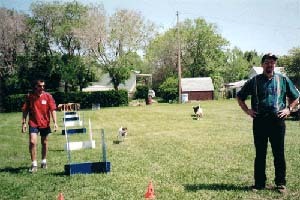 The August Flyball Tournament was a great success. They had a total of 32 teams attend over the two day event. The Tailwind Raffle Table was a huge success... their goal this year was to raise money for more matting but in the end a good portion of the proceeds went to rescuing dogs affected by the Hurricanes in the US. Between the club's donation and the added individual donations, Tailwind raised $1500 which was matched by a corporate donor. In all, $2500 was raised to help the rescue effort for cats and dogs. Tailwind members are now heading into the quiet time of Flyball...only 3 tournaments until next June when the "Rush" will start again. However, now is the time when Flyball classes are offered at Superdog Spectrum. Classes started on November 5th and will run for 6 weeks with the second level starting in the New Year. Come out to the Spectrum to watch the fun and I'm sure you'll be inspired to sign up! Congratulations go out to Bungee... Lisa's adorable Chinese Crested...who took Bermuda by storm recently when he traveled to the dog show there. Bungee was chaperoned by Lahni Thompson who showed him to a Group 2nd and five Group 3rd wins. Lahni was at the dog show in Bermuda with her Lakeland Terrier, Taxi, and her husband, Graham, to celebrate their anniversary. Foods Your Dog Shouldn't Eat or "(((LEAVE IT!!!)))" Dogs chew almost anything. Hey, if it's on the floor it's fair game, right? Unfortunately, certain foods and everyday substances that are perfectly fine for people can be toxic for dogs. Even a small quantity of the following substances can put your dog's health at risk. Alcoholic beverages. Because alcohol can be fatal to dogs, no amount of alcoholic beverage is safe& yes; even beer should be off limits. Chocolate is toxic to canines. The darker the chocolate, the more harmful. The methylxanthines (caffeine and theobromine) in chocolate can cause a dog to vomit, have diarrhea, experience rapid, irregular heart beat, have increased urination, and experience muscle tremors and seizures. The effects can be serious. Death from chocolate toxicity can occur with 24 hours. Coffee, tea and cola are people-food. They contain caffeine, a methylxanthine also found in chocolate. The signs of toxicity include rapid heart beat, hyperexcitability, tremors, and seizures. Macadamia nuts can temporarily cause muscle weakness, often in the hind legs. Other signs include vomiting, fever, and abdominal pain. The mechanism of the toxicity is unknown. Affected dogs recover with no treatment and no long-term effects. Onions and garlic have a chemical that damages red blood cells in dogs and can cause anemia. Even one small whole onion can cause death. So be particularly careful when disposing of left-overs that contain a significant amount of onions, such as pizza or Chinese take-out. The small amounts of onion and garlic powder used in pet foods is safe and well below the toxic levels. Raisins and grapes seem like fun toys to a dog. But they can cause vomiting, diarrhea, and kidney failure. The minimum safe amount is not known, so keep these foods well out of reach of curious muzzles. Sugarless gums and candies are certainly sweet, but the sugar substitute xylitol can cause a rapid drop in your dog's blood sugar. Moldy or spoiled food and garbage should stay safely in the trash. They can contain multiple toxins causing vomiting, diarrhea, and damage to internal organs. Yeast dough, like the kind used in making bread or deserts, is designed to expand. If swallowed by an unsuspecting canine, it can expand and produce gas in the digestive system, causing pain and possibly rupture of the stomach or intestines. Medications such as Ibuprofen, Tylenol, and Naproxen may give you some relief, but painkillers and other common medications can be deadly to your dog. Keep all prescription and over-the-counter drugs - including painkillers, ant-inflammatory drugs, cold medicines, diet pills, antidepressants, anti-cancer drugs, and vitamins - in closed cabinets out of your pets' reach. Never give your dog medication unless directed by a vet. Plants are pretty but possibly deadly for your dog. Many common yard and houseplants can be poisonous, including lily, daffodil, oleander, rhododendron, azalea, yew, foxglove, rhubarb leaves, and cycads. According to the ASPCA, thousands of dogs needlessly suffer (and many die) each year by ingesting these common household foods and substances. If you suspect that your pet has eaten any of them, seek emergency help right away. In order to avoid having to wrestle that banned tidbit from your dog when he has swooped it up off the floor, your dog's basic training should include such words as "Leave It" or "Spit". To find out more about teaching your dog these, and other, useful everyday commands, speak to the staff at the Spectrum and get the details about the class that's right for you. And from our Puppy All Star classes...Steve & Chewbacca, Shawna & Pepper, Margo & Picot, Patricia & Peggy, Shelley & Tucker, Paul & Hunter, Sherry & Josie, Gina & Yukon, Ron & Brie, Melanie & Hadley, Gayle & Angus, Ann & Tazz, Jean & Jazz, Kim & Jake, Sheila & Cayley, Heather & Monique, Andrea & Lindsay, Courtney & Scamp, and Lyndsay & Tana. The "come" is an important command because it can help keep your puppy safe. The RADICAL RECALL CLASS, which begins a new session at the Superdog Spectrum every six weeks, will help you & your dog understand and perfect this important aspect of basic training in a safe learning environment. Building and perfecting the "come" command is a great gift to yourself and to your maturing puppy. It's much more difficult to correct an existing misbehavior than to prevent it from the beginning. However, this will not be the case when you start a consistent training program with your puppy. 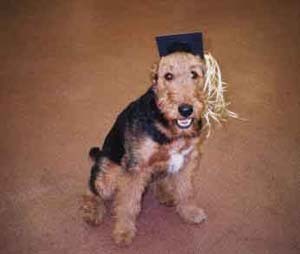 And remember, it's not just the dog who's a student and has to learn everything...the human must also learn. No dog is 100% hypoallergenic, according to the American Kennel club, but certain breeds are better for allergy sufferers than others. Allergy sufferers should look for breeds with non-shedding coats, which produce less dander, said AKC officials. Dander causes most pet allergies. Hairless breeds are also an option, the club said. "These breeds may be just what the doctor ordered for people with allergies," said Lisa Peterson, spokeswoman for the American Kennel Club. "There are a variety of sizes, energy levels and temperaments, yet all are well established in their coat-types." With all the small breed mixes that are being bred and large breed dogs that are now being crossed with standard poodles, there may be some non-purebred dogs that don't trigger allergies, but it is very difficult to tell which ones they are. Chances are your older dog doesn't frolic in the snow the way he once did. Or demand to go outside when the temperature dips. Not surprising. As most dogs age, they become more sensitive to cold. That's why it's important to prepare an older dog for the arrival of winter. Start with a trip to the vet for a routine check-up to rule out any new health conditions that may be worsened by the cold weather. The best way to protect an older dog from sub-zero temperatures is to keep him inside, especially if he has arthritis, respiratory problems, or other conditions. These may be aggravated by the cold. Yet every dog needs exercise, so try to take him for brief walks and increase indoor play to compensate. That's where SuperDog DayCare can be a welcome outing for your dog even if it's only 2 or 3 days a week. He'll be taken for 3 brisk walks every day and be able to play with other dogs inside where it's toasty warm. Get in the habit of checking your dog's paws for debris after a walk. His pads can easily become chapped or cracked from snow, ice, salt crystals, and chemicals. Wash or wipe his feet with a damp cloth to free his pads of any bits and pieces. Try to discourage him from licking his paws. He may ingest chemicals or salt that could cause an upset stomach. If his paws look sore or irritated, apply a thin coat of petroleum jelly. Also, be sure to trim fur in and around his feet to prevent ice and snow from getting trapped or consider natural wax products or doggy boots to protect his feet. Frostbite occurs most often on dogs' paws, so watch for swelling and any fussing over a specific area. It can take a few days for frostbite symptoms to appear. If he does suffer from frostbite, take him to the vet immediately. Dogs love antifreeze because it often has a very sweet taste. However, it's poisonous, even one or two licks! So be careful how you store it and check for antifreeze puddles in your garage or on your driveway. Be sure to mop any up and flush the area with water. Or consider buying pet-friendly antifreeze. If you suspect that your dog has ingested antifreeze, rush him to the vet right away. Winter is an easy time for a dog to pack on the pounds, especially if he's not getting out to the dog park and you aren't able to bring him to Dog DayCare regularly. Change his diet to compensate. If he gets less exercise, give him less food. Conversely, if he gets outside and exercises often, he'll need more calories than normal to produce body heat. But make sure to increase the amount you feed him slowly. Because your older dog may be more prone to the cold, he may appreciate the warmth of a sweater or the protection of a rain coat when it's rainy and damp. And he really won't care what it looks like as long as it keeps him comfortable.